Authorities (AAPA) will be held in Los Angeles, Calif., October 25-29. The first Type II MSD to use microprocessor control for greater reliability, less main- tenance, minimal power draw. Why is ORCA's computer brain significant? Because micro- processors have proven their reliability in extreme marine conditions. They're more precise, and draw far less power than a conventional electromechanical unit. ORCA's state-of-the-art micro- processor is based upon a tiny microchip about the size of your thumbnail. Once activated, it controls and monitors all system functions (motors, effluent levels, etc.) Should a malfunction occur, ORCA's micro- chip informs you through the LED equipped Remote Status Indicator (RSI) panel mounted on the bridge or at any convenient location. It even monitors its own operation and that of the RSI. Most remarkable, the micro- processor activates ORCA on demand only. So, your treatment system is only drawing power when treatment is needed. IMCO standards and is Coast Guard certified for crews up to 72. Yet, it's likely the smallest, lightest, most effective MSD in its class. And, ORCA easily connects to existing commodes. Dimensions: 42" x 18" x 29". Marine Supply Krotz Springs, La. See us at booth #809-Fish Expo. 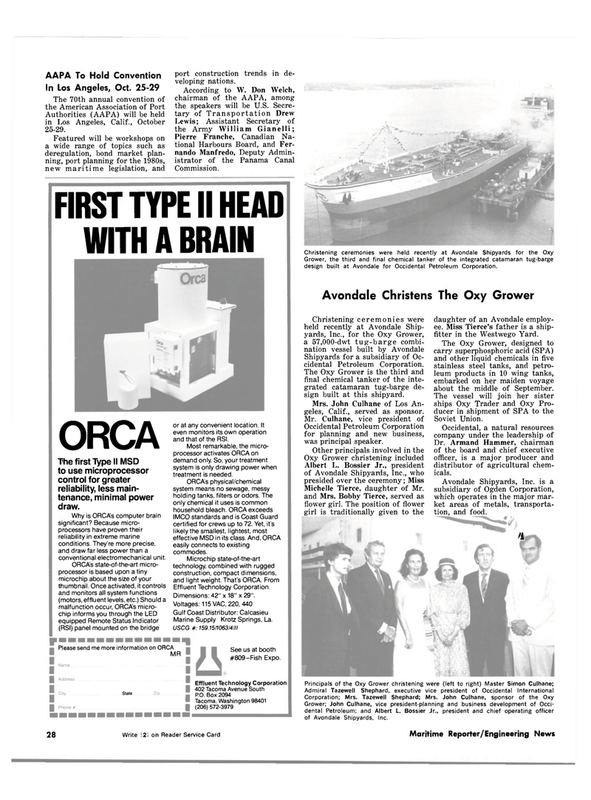 Grower; John Culhane, vice president-planning and business development of Occi- dental Petroleum; and Albert L. Bossier Jr., president and chief operating officer of Avondale Shipyards, Inc. port construction trends in de- veloping nations. Grower, the third and final chemical tanker of the integrated catamaran tug-barge design built at Avondale for Occidental Petroleum Corporation. Shipyards for a subsidiary of Oc- cidental Petroleum Corporation. The Oxy Grower is the third and final chemical tanker of the inte- grated catamaran tug-barge de- sign built at this shipyard. Mrs. John Culhane of Los An- geles, Calif., served as sponsor. Occidental Petroleum Corporation for planning and new business, was principal speaker. Michelle Tierce, daughter of Mr. and Mrs. Bobby Tierce, served as flower girl. The position of flower girl is traditionally given to the daughter of an Avondale employ- ee. Miss Tierce's father is a ship- fitter in the Westwego Yard. The Oxy Grower, designed to carry superphosphoric acid (SPA) and other liquid chemicals in five stainless steel tanks, and petro- leum products in 10 wing tanks, embarked on her maiden voyage about the middle of September. Dr. Armand Hammer, chairman of the board and chief executive officer, is a major producer and distributor of agricultural chem- icals.